If you attended the Big Lunch, you’ll no doubt have noticed the bee hives at the top of the allotments. The Elm Village bees have now arrived. EVTRA volunteers and staff from Camden Garden Centre helped get them get settled in place. The bees were kept in their temporary hives and then moved into their permanent hives. 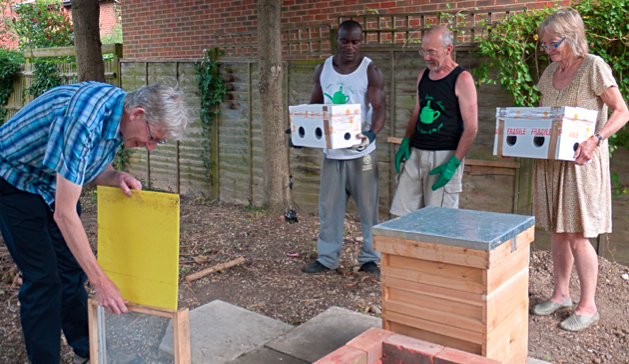 EVTRA volunteers, Camden Garden Centre staff, and bees (not pictured, but buzzing curiously in the boxes).